Auto accidents are among the leading causes of injury and death in the United States, causing 3 million injuries and killing over 40,000 people per year. Missouri accidents involve cars, trucks and motorcycles, and can have devastating consequences for those involved. In addition to medical bills and the cost of rehabilitation, victims of Missouri car accidents may face other economic damages such as time off work and lost future wages. Send your Missouri Accidents claim to a lawyer who will review your claim at NO COST or obligation. Missouri auto accidents can result in serious injury for the people involved. Even those who survive their ordeal may suffer with permanent injury, including head trauma, spinal cord injury, burns or neck injuries. Auto accidents are not always straightforward. Sometimes, even when liability seems obvious, there are factors to take into consideration. For example, if a person is driving while under the influence of alcohol, the person or establishment that served him the alcohol may also be liable for injury and damage. There may be issues if the person who caused the car accident is underinsured or if the vehicle in question has defective parts. Missouri law uses a principle called comparative fault (or comparative negligence) to determine compensation for claimants in automobile accidents. This means that if a person is partially at fault in an accident, the amount of damages that person receives is reduced by the amount of the fault. For example, if a motorist is deemed 30 percent at fault in an accident, the damages awarded to that person are then reduced by 30 percent. 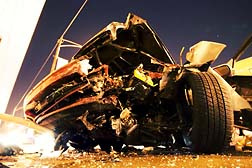 In Missouri, victims of automobile accidents may be eligible to file claims for past and future medical bills, compensation for damage to the vehicle, past and future wage loss, costs incurred as a result of the accident, emotional distress, permanent disability, permanent disfigurement and/or funeral costs. Missouri car accidents can have catastrophic consequences for the people involved. There are many causes of car accidents including driver fatigue and inattention, speeding, failure to yield right of way, improper road maintenance and defective cars or defective automobile parts. According to the NHTSA (National Highway Traffic Safety Administration), there were 960 total fatalities in Missouri car accidents in 2008. Like all auto accidents, motorcycle accidents have a variety of causes. In some cases, the motorcyclist fails to pay attention to the rules of the road, speeding while weaving in and out of traffic. In some cases, other motorists on the road fail to follow traffic rules, neglecting to yield right of way to motorcyclists or not seeing motorcyclists in their blind spots. 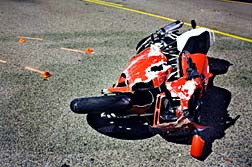 In yet other cases, improper road maintenance can cause motorcycle accidents. No matter the cause, injuries sustained in motorcycle accidents can be devastating. Because motorcyclists do not have the same protection as other motorists, they are vulnerable to spinal cord injury and brain damage. According to the NHTSA, in 2008 there were 107 total Missouri motorcyclist fatalities, up from each of the previous four years. Truck accidents are much more than simply accidents involving larger vehicles. There are many rules regarding how trucks used for interstate commerce are driven and maintained while on the road. Furthermore, liability may extend not only to the truck driver but also to the company that owns and/or operates the truck and anyone responsible for the truck's maintenance. Kansas City Bears Brunt of Liability for Miss..
Alcohol not the Only Cause of Impaired-Drivin..
Was Fatal Missouri Accident an "Act of God?"